I haven't given DC Direct's DVD Maquettes much thought, seeing as I generally like to collect comic versions of characters, but a couple have caught my attention recently and have ended up added to my collection. 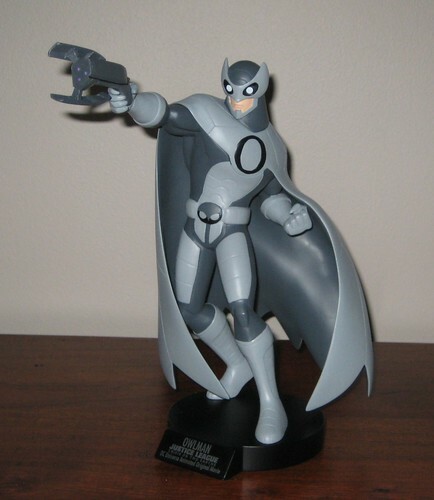 I'm going to take a look at two tonight, and the first is the Owlman DVD Maquette from Justice League: Crisis on Two Earths. With many of the main heroes featured in this DVD having already appeared in the Maquette line, it makes since to feature one of this story's central villains in the piece for this film, and Owlman is a great choice. This maquette comes in three pieces: main statue, base and gun. Even so, it's a big box, due the fantastic cut of Owlman's cape. His animated costume is extremely good looking and lends itself to a dynamic sculpt. His costume is basically in greyscale, and yet it's a very eye-catching piece. The pose, the angle of the gun, the sweep of the cape all make this a very enjoyable piece that sits happily amongst my comic-inspired Batman busts and statues. A big win in my book! 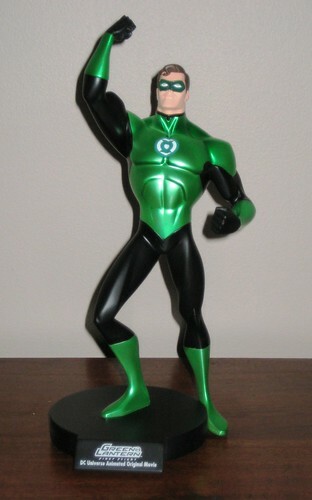 While we're talking DC Direct Maquettes, let's also take a look an earlier release: the Green Lantern: First Flight DVD Maquette. It was a chance eBay bargain on this piece that got me started on the Maquette train. Finding this on eBay at such a great price was a good lesson that you can often find statues at good prices on the secondary market shortly after release - I just need to learn not to jump right away on pieces I'm not 100% sure about, or wait too long on ones I really want, because after awhile they get way too cost prohibitive when you count in the shipping to Oz. As for the maquette: once again we have a nice dynamic sculpt, with GL actually stepping onto the base with one foot off to the side. The paintwork here is a great, with a metallic green adding to the texture. One odd thing I find about some of DCDs busts and statues is that they're often photographed in promo shots at an angle that's not quite possible to replicate in real life, at least on a flat service. This is the case here, with Hal looking more skywards in person than in the pics. It's a small quibble with what is an otherwise fun piece. That's me and DCD Maquettes for the moment. I certainly don't see myself buying every release, but it is good to know that they can be fun purchases for the right character! You can see more pics on Facebook, discuss this at the AFB Forum, and comment on this to enter the February AFB Comment of the Month Contest. I've nevr quite understood the cartoon based versions. To be sure they look fine and all, but I don't understand who they're aimed at, since kids aren't likely to want them (they don't do anything), and the more adult aged collectors are more likely to spend their coin on the comic versions. I'm sure I'm missing something here, but it seems like a narrow market segment to aim for. they look nice, but I'd pass. I was tempted for the Wonder Woman one before I snagged a deal on the Cover girls statue. I wonder how inclusive this line is. a bunch of DCAU statues of this quality would be pretty sweet (and better than the JLU figs). Do these actually come in a limited DVD version of the film or is it just a release to coincide with them? Either way, they are nifty. obviously there r some sterotypes out there bout adult collectors... i’m an adult collector & i like comic versions of DC/Marvel character as much as anime/cartoon versions... on the other hand, these statues have a neat colour scheme & i think they were sculpted with simplicity & dynamism, they do look wonderful !!! love how well that green latern one looks even though statues are not my thing. owl man looks like he is just waiting to screw someone over. too bad Mattel did not have time to do figures for the film. for they could have used that manquete as the design for owl man. I'm all for it, these statues are simple and such a clean and dynamic look, I love it (I like Owlman more though). These maquettes are items I would love to collect, but the combination of price and all the other things I like to buy make it financially unlikely I'll be buying any. But I do watch eBay for a good deal on them anyway, just in case. So my question would be whether or not you have seen the DVD's? I would like to start looking for them and have heard good things, what are your thoughts? I would love to see the Owlman make it to DCUC sometime. ooh the owlman one looks great. perfect lines and a real sense of movement. and even the grey colours look great! I have most of the DVDs, and I love them. Crisis on Two Earths was a great film, interesting story, great animation, good acting. The only drawbacks are the voices of Superman and Batman. I would have preferred Tim Daley or George Newbern for Superman, and more so, Kevin Conroy is Batman. Where is he? The had him for Public Enemies, but he should ALWAYS be Batman for these animated films. But anyway, yeah, I love these films. As long as they keep making 2 or 3 a year I will buy them. And I'll try to get the maquettes as is possible too.